SuitSupply ad ‘Start smoking’ too provocative? – ¿¡ tjongolongo ?! 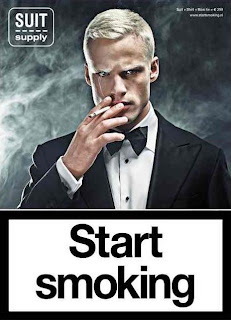 The word smoking in the Netherlands is Dutch for tuxedo so the company is just basically telling people to start buying a smoking/tuxedo at SuitSupply. However, I can imagine how this can be just a little bit too provocative. A Dutch anti smoking foundation, Stivoro, isn’t happy with the campaign which I can understand as well. They feel it might entice younger people to start smoking. I personally think it’s funny, but than again, I don’t smoke and the ad wouldn’t get me too smoke, maybe I’m just getting to old to be influenced :). The campaign did get me thinking though, where do we draw the line with advertising or other ways of communication for that matter? Did SuitSupply cross the line?